Since launching ThreeBags yesterday, I have received a lot of positive feedback as well as some great proposals for enhancing the website. 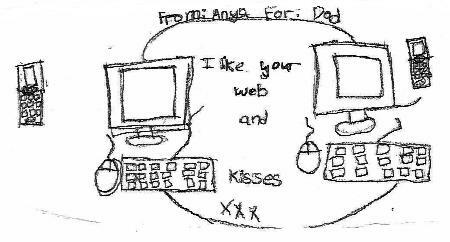 But, I’ll be frank, the best appreciation came from my daughter, Anya, who is now 7, who gave me the drawing shown above today. ThreeBags showcases the best basic, value and prestige mobile phones, smartphones, digital cameras, MP3 players, LCD televisions, home cinema systems and laptops available in Mauritius. A few months ago, I realised that even though technology surround us, choosing and buying a technology product is tough: too many buzzwords, too many models, too many shops and so few people willing to explain things clearly. 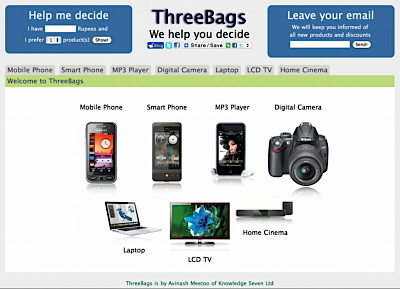 This is how I got the idea about ThreeBags: a recommendation website with seven categories of products (from mobile phones to home cinema systems) and three recommended products per category: one basic, one value and one prestige model. One interesting aspect of ThreeBags is that you can specify your budget and let ThreeBags give you an optimal set of technological products within that budget. You will notice that there are no advertisements on ThreeBags. Additionally, I do not get paid by anyone to recommend a specific product. My evaluation criteria are product features, design, availability in Mauritius and price only.